Do Drug Store Whiteners Really Work? Americans spend millions of dollars every year on tooth-whitening products. Some products work, others are a waste of money. Here are some of the most common treatments and suggestions for avoiding stains in the first place. Coffee, cigarettes, and red wine discolor teeth, but some discoloration is just a normal part of aging. All teeth turn yellow or gray as we age, no matter what we eat or drink. How you take care of your teeth matters. If you have poor oral hygiene, it doesn’t matter what kind of product you use. If you have cavities, tooth decay, or gum disease and you apply whitener, it’s going to hurt. Whether you whiten your teeth at home or have it done by your dentist, make sure your teeth are healthy first. 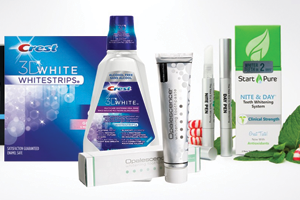 Whitening Toothpaste – All toothpastes help remove stains from the surface of your teeth. Whitening toothpastes also contain peroxide that reaches stains inside the tooth. Most whitening toothpastes lighten teeth about one shade. Crest Whitestrips – These clear strips have peroxide gel. Apply them to your teeth and leave them on to lighten teeth up to three shades. Several repeat treatments are necessary. Crest Whitestrips often result in teeth that are extra sensitive to heat or cold. If your gums become irritated, discontinue use, since irritated gums are more likely to become infected. Whitening Rinses – Some mouthwash contains whitening products. When you rinse your teeth to fight bad breath, hydrogen peroxide also swirls around teeth. The product doesn’t stay on your teeth very long, so it isn’t going to make a huge difference, but they do freshen breath and help fight gum disease. Professional Tooth Whitening – Dentists use extremely concentrated whitening ingredients to remove stains both on the surface and deep within teeth. It gives you results fast and is the safest way to whiten your teeth. Results are much more dramatic than those seen with drugstore products. Having your teeth whitened by a professional is also the safest way to go. Your dentist will make sure your teeth are healthy enough for whitening and take steps to prevent sensitivity. Professional whitening removes stains from aging, smoking or other tobacco use, and stains from foods or beverages such as coffee and red wine. Dentists protect your gums before applying whitening products, so you don’t experience any irritation. You go home with a bright, healthy smile that lasts. Cobblestone Park Family Dentistry offers several whitening procedures. Contact us today to find out which one is right for you.